Chimpanzees are our closest relatives. Natural habitat of these primates is Africa and most of them can be found in the rainforest, grassland and woodland of West, East and Central Africa and specifically here in Uganda, chimpanzees are found in the primate capital, Kibale National Park, Ngamba island sanctuary of chimpanzee, in Queen Elizabeth National park around the Kyambura Gorge widely known as the valley of Apes and in Semuliki National Park. Many of these chimpanzee families in here are habituated and they can do their day today activities in the presence of man. Their body is covered with long dark hair. Unlike other monkeys – they don’t have tail. They live in large communities of up to 150 members. Chimpanzees are highly endangered animals. Loss of habitat and increased commercial hunt reduced the number of chimpanzee from 2 million to 300,000 individuals. Chimpanzees are omnivores. This means that they eat both plants and animals. They like to eat fruit, insects, eggs and meat. Chimpanzees thumb is in opposition with other fingers which means that their thumb is not in the same line with other four fingers (just like in human hands). Specific shape of hands allows them to develop and use tools, to groom each other. Chimpanzees use tools like sticks to extract ants from the trees/holes, or stones to break the shell of the nut. Chimpanzees can be infected with same diseases like humans: measles, ringworm, hepatitis B, influenza. They exchange kisses, hugs, touches in their community and use complicated system of sounds to communicate. Grooming is important ritual that creates close bonds between community members. It can also calm the nerves of excited animals. Chimpanzees are 6-7 times stronger than humans. When chimpanzees are bored, they organize various games to entertain themselves. Chimpanzees in captivity can learn human sign language. They spend night in nests in the tree. Nests are made of leaves and branches. Each night, chimpanzee changes location of his nest. Although they use all four limbs for walking, chimpanzee can walk on two legs. Female will give birth to a baby each 3-4 years. Bond between mother and young animals is very strong and it lasts over 7 years. Baby chimpanzee has white tail tuft that disappears in time. When they are ill, chimpanzees will eat medicinal plants to heal themselves. In the wild, chimpanzee lives 40-50 years, and in captivity between 50 and 60 years. 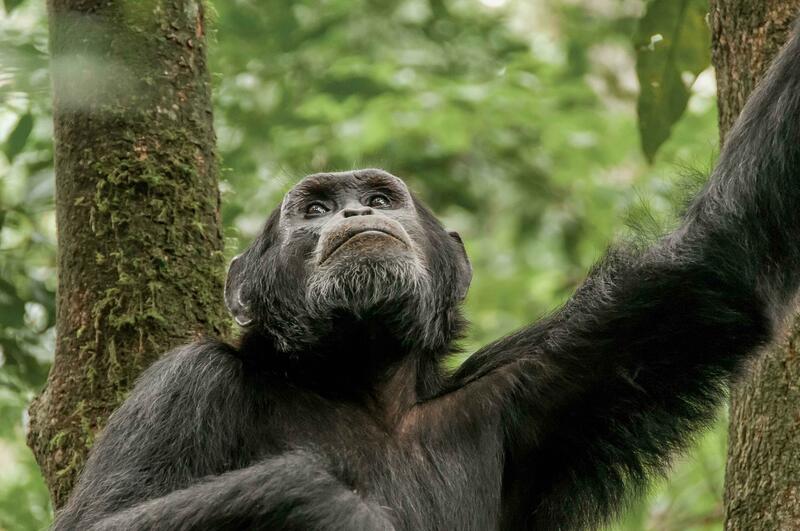 Contact us today or arrange your chimpanzee safari in Uganda, send us an email via info@travel256.com or speak to our consultant on +256701367970.